100 years ago, on 30 January 1915, a charity International rugby match was played at the County Ground in Northampton between Scotland and England, arranged to help Olney resident, former Saints captain and England international Edgar Mobbs recruit sportsmen to his own World War One battalion. 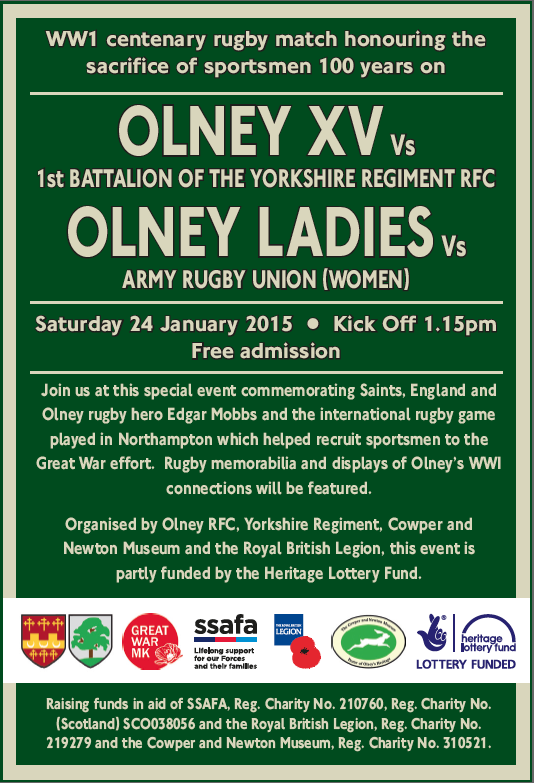 To commemorate the centenary and honour the 16 Olney players who were killed in the Great War, Olney RFC is hosting a special event and two memorial rugby matches, with Edgar Mobbs’ family in attendance, on Saturday 24 January 2015, where current players from the East Midlands region will line up against The 1st Battalion of the Yorkshire Regiment and Olney Ladies will face the Army Womens XV. Olney RFC and Cowper and Newton Museum are working in partnership with Great War MK to deliver this event.